If there is something I will not refuse myself to indulge in, it would be cheesecake. I just love the richness of the filling and the crunchiness of the crust. And there's the topping which help balances the rich cheese taste.When combined the tastes counteracts each other in a delightful way. Last year I made three chocolate cheesecake for my sister's birthday. 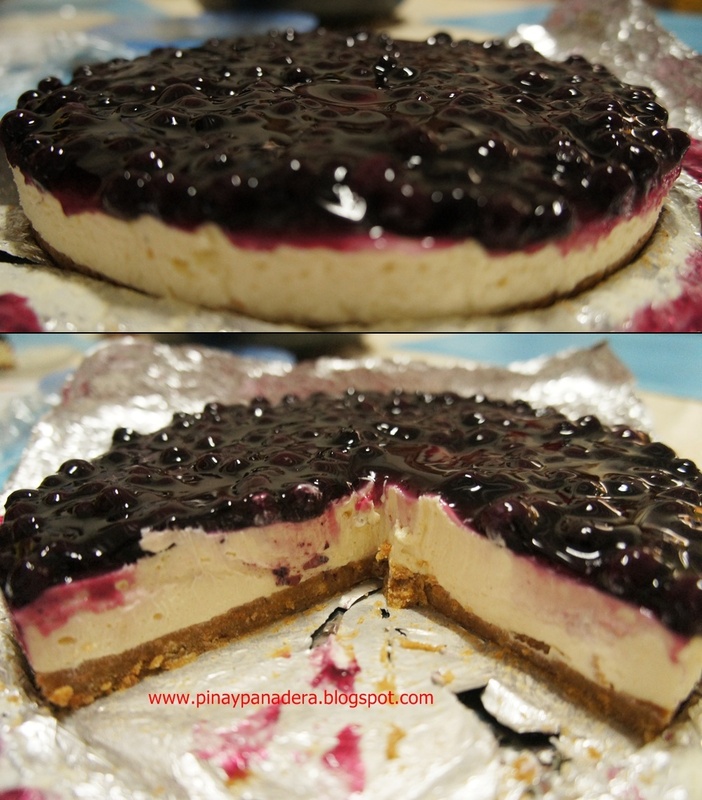 This year, our friend Maggie requested a blueberry cheesecake. I bought the ingredients couple of weeks early. Because of our hectic schedule, we couldn't find time to get together.Then last week we decided to have barbecue at my place. 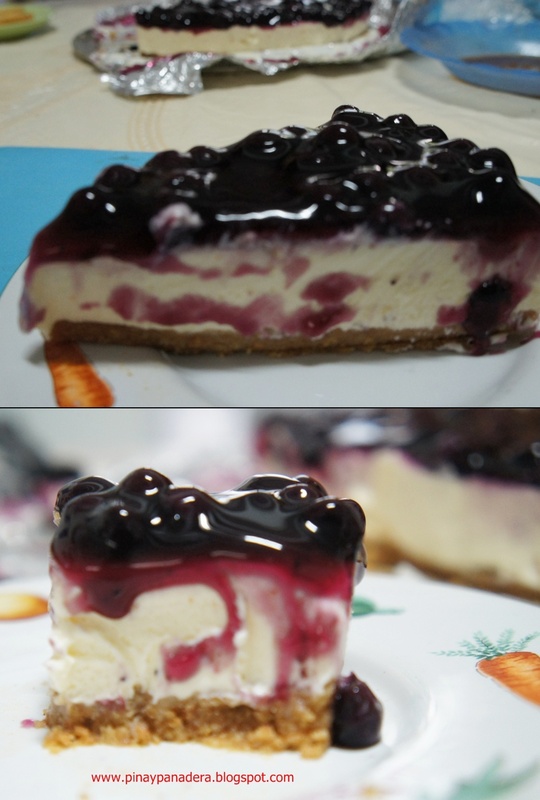 I had finally got the chance to make blueberry cheesecake.We chose Sunday as it was the time favorable to all. Everyone agreed. My spring form pan was too big for one recipe so I used my 20 cm entremet ring or what you call mousse cake ring. I covered the ring with aluminum foil for easy removal of cheesecake. I happened to find a recipe for no-bake cheesecake from My Mom-Friday. I made some modification here and there. If you have no food processor, put the digestive biscuit in a strong plastic bag. Crush them with a rolling pin until fine. Place the crumbs in a mixing bowl. Add the sugar, cinnamon powder and nutmeg. Mix. Then add the softened butter.Blend well. 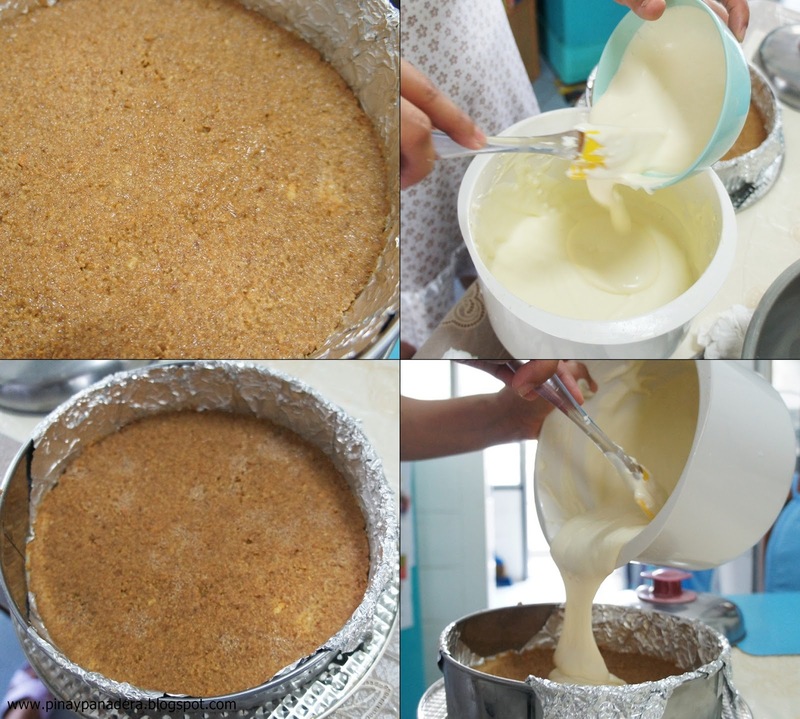 Press the mixture into the base of your ring. Be sure you cover the entire base with the mixture evenly. Freeze the crust to harden while you make the filling. Pour cream into the mixing bowl. Whip on medium speed. Add two tablespoon icing sugar while whipping the cream. When soft peaks form, it's done. Transfer the whipped cream into another bowl, chill. Meanwhile, soak gelatin leaf in cold water to soften. Wring gently to remove excess water. Combine 3 TBSP of milk and hydrated gelatin leaf. Place in a sauce pan of simmering water. Stir just until it melts completely. Remove from heat. In the same mixing bowl where you whipped the cream,place the cream cheese. Beat until softened. Add 1/2 cup condensed milk. 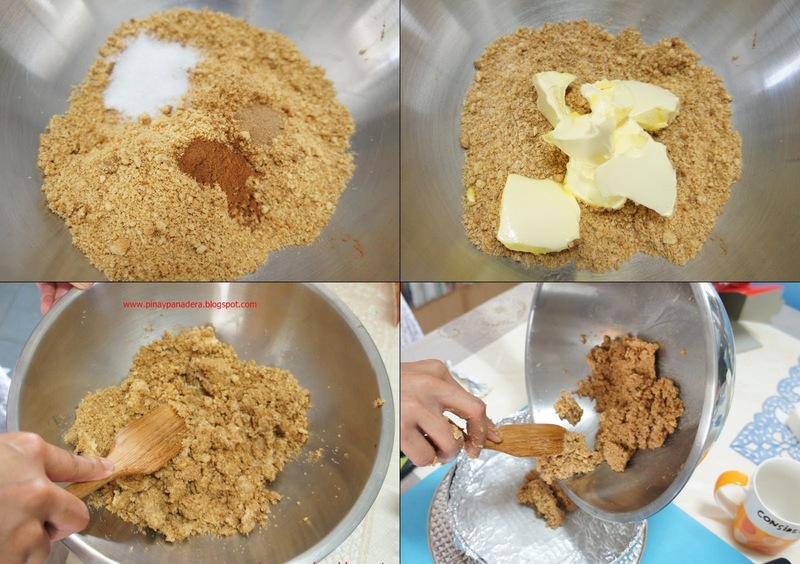 Scrape the sides of the bowl to make sure the ingredients are evenly mixed. Continue beating until fluffy. Set aside. 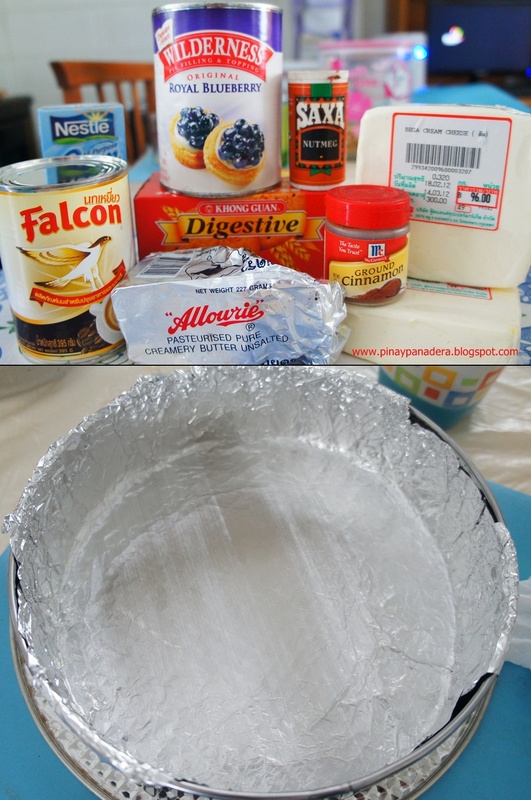 Add the gelatin/milk mixture into the cream cheese mixture. Whisk. 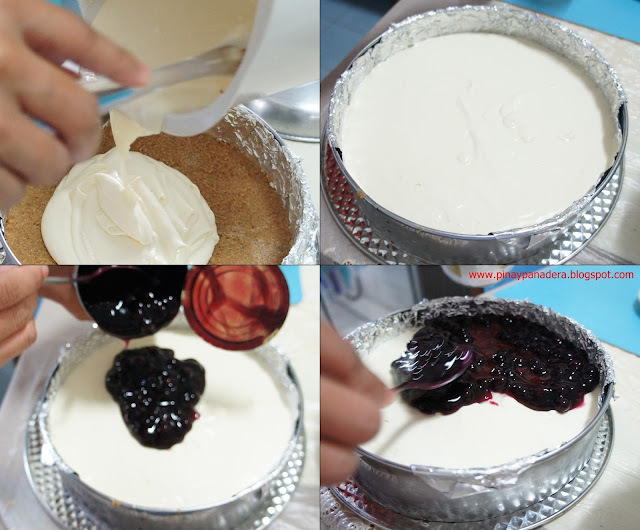 Fold in cream cheese mixture into the whipped cream. Beat on medium to high. I beat mine for a minute just to mix them completely and of course, add volume. Lastly, add lemon juice. Beat until every thing is well combined. Pour the cheese filling into the prepared ring. Spread it evenly with a spatula or spoon. Tap the pan lightly to knock out air bubbles.Cover with cling film. Chill for a few hours. Right before serving, empty a can of blueberry topping into the ring. The filling can be good too with any sort of toppings. Remove the ring and the aluminum foil. There was only one word to describe this rich, creamy, luscious dessert. Divine. Yum! This surely looks decadent and delicious!!!! Thanks Kat. How was the mango-passion fruit cheesecake?